World IPv6 Launch — Success! Did you notice a near-total collapse of the Internet today? Couldn’t Google if Gordon Brown owes you money? The stream of Facebook pokes suddenly stopped? No? That’s because the Internet kept working just fine, despite that today marks an important event in its history: 06/06/2012 was World IPv6 Launch day. Everything on the Internet needs to be reachable one way or another. This is where an IP address comes into play. Think of it as a telephone number. When you type in a website’s URL in the browser, the browser asks a DNS server (and think of that as a giant phone book/contact list) what the IP address is. Once it has an answer, it starts dialing, er, connecting. This has worked fine since the Internet’s inception. And with a little more than 4 billion IP addresses available, that should keep everyone happy. And until February 2011, that was so. On the 3rd of that month, IANA gave out its very last set of IP addresses, which are now in the hands of various organisations authorised to distribute them to ISPs and others. And these organisations, despite some very strict rules, are handing them out like hot cakes as, well, the Internet is growing rapidly and needs to be fed. The Asia/Pacific region ran out of its allotment shortly after IANA handed them their last set of IP addresses, in April 2011 to be exact. Europe is about to run out too, currently estimated to be in August 2012. So how does one solve this problem? Just how telephone numbers have grown from being just four, five digits long to a dozen or so digits, you make the IP address longer so it will fit more. Easy, right? Well, putting it that way, yes it is. In practice, it’s a different story. In 1998, they started working on the Next Generation Internet Protocol (IPng), which they have subsequently renamed IPv6. They increased the length of the current IP address from 32 bits (think of them as digits) to 128 bits. That is quite a jump. In fact, it’s such a large jump that you could give each dust particle floating around in your office or house its own IPv6 address and still have plenty left. Equipment, and software, built around IPv4 weren’t designed for this. Upgrading them was a painfully slow — and expensive — task. But now we’ve hit a critical point where we must start using IPv6, or risk the future of the Internet. 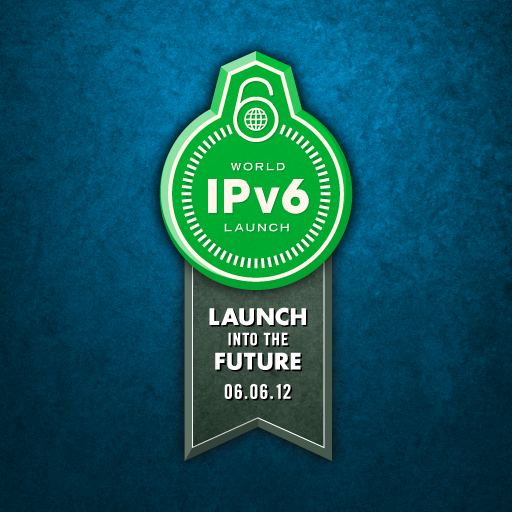 And so, World IPv6 Launch day came to be. Some of the Internet’s largest companies, such as Google, Facebook, Microsoft Bing and Yahoo, as well as ISPs like the Dutch XS4ALL, well known for its long participation in IPv6 projects. Equipment manufacturers like Cisco and D-Link are also participating, which is not only important for ISPs but home users alike. There are roughly 3000 website operators that are participating, including, you’ve guessed it, Myatu’s. In fact, this website has been accessible via IPv6 since 2009, but that was through a separate address (and now through its main address — you could be using IPv6 right now!). And how does one get IPv6? Most browsers are now ready for IPv6, and so are most operating systems (Windows, Linux). But your ISP needs to support IPv6 as well, and you can perform a quick test at Test IPv6, if you’d like to find out if your browser and ISP are using IPv6. If you are a website owner, there are various methods of getting IPv6 connectivity. If you are not that technically minded, I can highly recommend CloudFlare, which this website is using as well. Not only does this add an extra layer of security and help speed up your wesbite, they also provide a 1-click setting to enable IPv6. For those with a bit more technical know-how, I’ve mentioned in other posts how to enable 6-to-4 tunneling, which can be used in conjunction with Hurricane Electric’s or SixXS’ free tunnel broker services. This is particularly of interest to those who’s hosting provider does not have native IPv6 support. If you prefer to use native IPv6 instead, you need to find a hosting provider that provides it. I currently use two providers for my servers, both of which support native IPv6: OVH and Edis. The fact that today went without any serious incidents that impacted the Internet, IPv6 will be a definitive replacement for IPv4. If you haven’t already, now is the time to start upgrading your equipment and software. I keep servers happy, and they keep me happy. Myatu’s Tech Blog, from the site that has been wasting bits and bytes daily, since 2008.